It's back and it's growing. 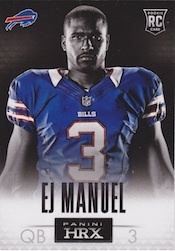 2013 Panini Prizm Football makes the brand's sophomore gridiron tilt. All the trademarks of Prizm are here along with a fast-growing number of Prizm parallels. The 2013 Panini Prizm Football checklist has 300 cards. Included are 100 rookies that fall one per pack. So while they're short printed, putting a set together is feasible. Like the Refractors that run rampant in Topps Chrome, the line of Prizm parallels is growing as well. Hobby parallels include Orange Die-Cut (#/50), Gold (#/10) and one-of-one Black Finite. Prizms combine to fall three per hobby box. Additional color can be found in jumbo boxes. These have exclusive Light Blue Pulsar, Purple Cracked Ice (#/40) and Die-Cut Light Blue Pulsar (#/15) versions. Retail packs have their own assortment of Prizms including Green, Blue (Walmart), Blue Pulsar (Walmart), Camouflage (Target) and Red Pulsar (Target). Autographs once again land two per hobby box. They have both basic and Prizm parallel versions. 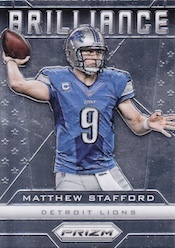 2013 Panini Prizm Football has several basic inserts as well. Rookie Impact spotlights top first-year players. Decade Dominance reaches into the past, honoring players with long careers. Monday Night Heroes includes players who have shone brightly in football's marquee weekly match-ups. Brilliance inserts return as well. Each basic insert set has two cards in every hobby box. HRX, Panini's line of video cards, return but with a new direction. Rather than having the video player embedded into it, the card has a QR code on the back. This allows for more collectors to get exclusive content. Videos can also be updated and added to. Featuring 300 cards, including 100 rookies. Shop for base sets on eBay. Click here for a detailed look at the Prizm parallels and where to find them. Cards 101-178 had a production issue confirmed by Panini. 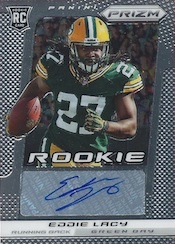 Base versions and Prizm parallels (#/25) have black borders. Black Finite cards (1/1) have the proper background pattern but no black border. Good: Clean design, solid photography, lots of color, new HRX format makes a logical technological leap. 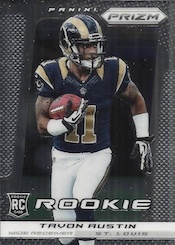 Bad: Too many exclusive parallels and not enough common versions in hobby, bland inserts. 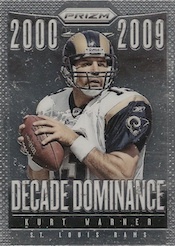 The Bottom Line: 2013 Panini Prizm Football falls in line with the company’s other Prizm sets. The base set is great and comes with plenty of gorgeous parallels. However, tracking them all down is quite the task given their exclusive nature. While there are hits to be found in the way of low-numbered parallels, it probably works best as a set building project. The base set takes on the same look as 2013 Prizm Baseball and Prizm Hockey. The consistency is good, particularly since the design works. Player shots are sharp and burst with color. The borders are a little too thick, but they lend well to the Prizm parallels. I’m not as big a fan of some of the basic inserts. Using the same chromium approach, they don’t add much to the overall release. 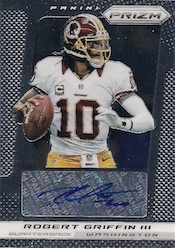 While sticker autographs are a fact of the hobby, they should be avoided on chromium cards whenever possible. The contrast between the card stock and the sticker stands out far too much, making them much less attractive. From a set-building standpoint, 2013 Panini Prizm Football is great. It covers all the major players and collects lots of rookies. However, Panini’s made it a little too tough to put together. I would like to see more products drift away from the “one rookie per pack” format and just include them alongside the veterans. There are enough sets with short prints and it’s not adding much perceived value, if any. The current box format requires collectors to buy more than one box as it already stands. Another frustration is the dilution of Prizm parallels. While base cards have more than ten parallel versions, too many are exclusives to certain pack types and stores. Hobby boxes deliver some of the rarest, but they’re tough to hit. Bringing a little more color into hobby would help bolster those packs, perhaps by looking at combining some of the overlapping retail exclusives. For example, why not fold Camouflage into hobby and make Target packs and blasters both have the same exclusive? After 2012, it’s a tough road for 2013 products. 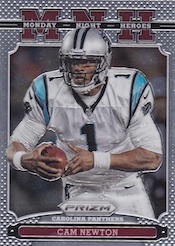 2013 Panini Prizm Football lacks some sizzle unless you land one of the rarest parallels. By limiting the number of common parallel types, there isn’t a lot of variety in hobby. I like the base set a lot. Well, other than having a bunch of short prints to chase after. That said, the product feels a little dull. I think if Prizm focuses more on making hobby boxes a little more colorful and perhaps cutting a few of the bland basic inserts, the configuration and fun would be tightened immensely. One area worth highlighting is the evolution of Panini's HRX video cards, which debut here. Over the past couple of years, the cards have been elusive and presumably pricey to manufacture. By switching to a QR Code format, it makes video content more accessible to the masses (as evidenced by the number of cards per box) as well as open up the possibility of easy content updates. Always a great product. Autos look great! Nice product but I pulled a Daryl Richardson auto that has a black border and some blue/green highlights or dots on the sides. Not listed in cardboard conn. anyone know what it is? Definitely not a big fan of sticker auto, but try sometimes. Especially this kind of shiny cards that looks awesome. I buy 3 jumbo boxes and this product is pretty honest. Purple prizm looks very nice. Hope to see this product with oncard auto one day, like the other brand. I love the solid manufacturing without a curve that offers these panini prizm cards. Your checklist seems to differ with the product detaila page regarding the light blue and blue parallels. Can you confirm which are found only in jumbo hobby boxes and which are retail/Walmart? The product details page says one thing and the checklist says the opposite. J Martell � Walmart has Blue and Blue Pulsar. Jumbo packs have the Light Blue and Die-Cut Light Blue. It is a good product for the price. It is a bit disappointing that there aren’t as many numbered as there are in the more recent Prizms though. In my box I didn’t get any numbered, but I got a Sean Lee auto which was a nice pull. 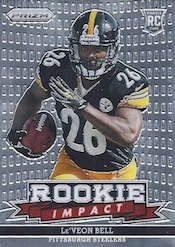 2013 Prizm Factory Sealed Football JUMBO Hobby Box Le'Veon Bell RC ? ?